Nothing raised supporters' expectations for a night at Old Meadowbank in the sixties more than a visit from the great Ivan Mauger, and the prospect of the battles between him and the top home men Dougie Templeton, George Hunter and Wayne Briggs. 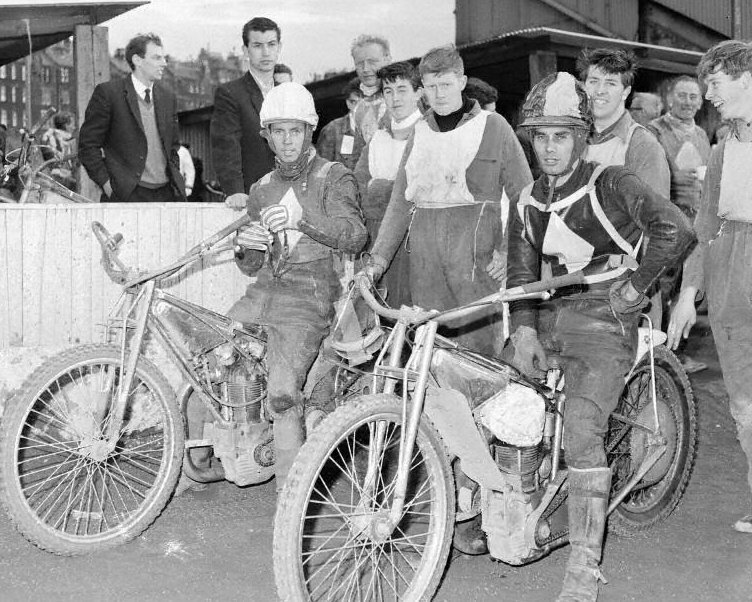 This shot from 1st August 1964 was taken on a night when Wayne was absent through injury, and in fact shows the Diamonds' heat 13 pair of Bill Andrew and Ivan Mauger preparing for the race with the scores level at 36-36. There was no happy ending for the Monarchs as Mauger won the heat from Doug Templeton, with Bill Andrew beating Jimmy Tannock for the vital point. Earlier Monarchs had led from heat 5, and Dougie had beaten Mauger in heat 9 with a great ride from the back. Newcastle used two tac subs but Monarchs were still 6 up with three heats left. After that things went downhill! Ivan also retained his Silver Sash from Doug, after the home captain had made the gate. Well, Mauger was good!